Koala sewing studios and accessories are the very finest products for the home sewing enthusiast to organize supplies and facilitate the creative sewing process. 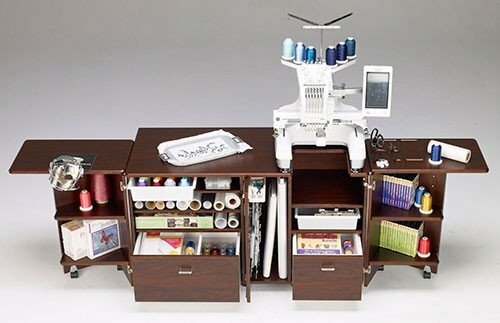 Proudly custom built to your specifications right in the USA, with eight color options and countless accessories to make your sewing studio truly unique and productive for YOU! Top drawer delivery is available to your home for only $399, which includes the delivery and set up of the studio to the room of your choice, including up or down two flights of steps, and the removal of the packaging materials. We are proud to be a showcase dealer and invite you to stop in and experience for yourself the ultimate in sewing furniture for your home. We would be happy to assist you in designing your dream studio! The Koala Artisan is built with the same top-notch construction, thoughtful design and custom options you love in all Koala Studios, plus a more expansive work surface and special storage customized for your embroidery machine. There's ample space for you, your creativity and your creative tools. The DesignPro offers the most work surface to the left of the embroidery machine, and the largest drawers of any Koala Studio. Order the DesignPro with the included Embroidery Module Drawer that perfectly fits the Viking Designer EPIC or choose three standard drawers for maximum storage. 4. Embroidery Module Drawer makes it easy to store your embroidery attachment when it's not in use. The Koala Slimline Artisan has been thoughtfully designed for the embroiderer with specialized storage for your embroidery module and hoops, and a slide out thread closet for 100 spools of tread- all in a space saving studio less than 4-1/2 feet wide! The Slimline Artisan is the ultimate studio for smaller spaces. 1. 3-1/2″ inches deeper than standard Koala Studios. 2. Built-in, glide-out Thread Closet holds 100 spools of thread. 3. 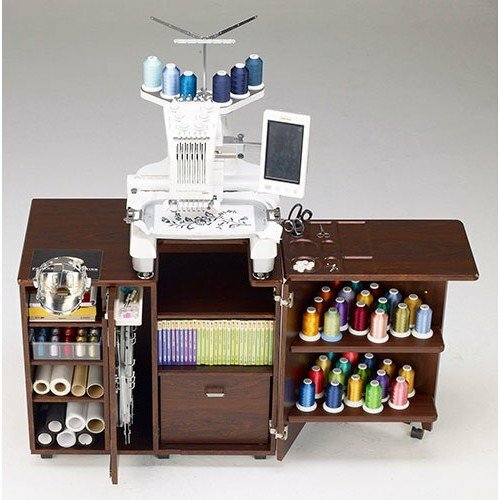 Built-in, glide out Embroidery Module Closet provides convenient storage for your embroidery attachment. 4. XL Life is included as a standard base model feature and smoothly raises and lowers large, heavy machines. Sew and embroider at high speeds without platform vibration. 5. Right and left palettes attach to the bi-fold doors for expanded work surface and storage. 6. Doors fold flat to the sides when not in use. 7. Built to a standard height of 29-1/4.” Add 3″ or 6″ of extra height (optional). 8. Rounded corners and beveled edges prevent fabric snags. The Koala Slimline Artisan integrates Koala’s best design features into a studio that fits into smaller spaces. The Slimline Artisan is ideal for top-of-the-line Baby Lock and Brother sewing and embroidery machines, as well as many other makes and models. Not all embroidery modules will fit in the glide-out Embroidery Module Closet, confirm machine model prior to placing an order. Base Model Includes: XL Lift, Left And Right Front Door Shelves, Notion And Fabric Palettes, Embroidery Module Closet And Thread Closet. 29-1/4″ Standard Height. 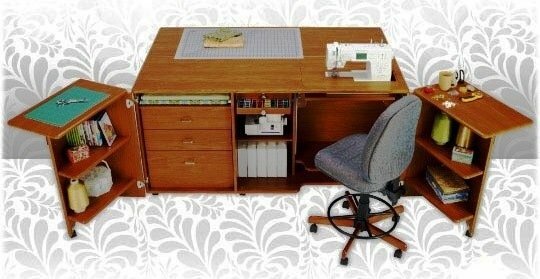 The QuiltMate Plus IV Sewing Cabinet has a lot of table space for moving a quilt around while quilting. 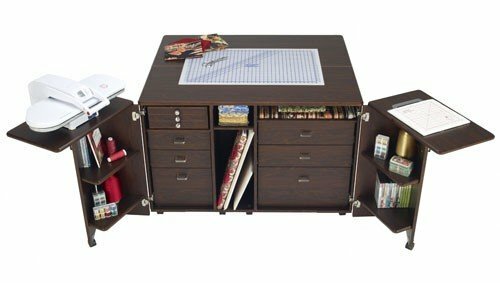 Koala Studios sturdy and sleek designs make buying the QuiltMate Plus IV Sewing Cabinet a no brainer. The QuiltMate Plus IV Sewing Cabinet ships directly from Koala. 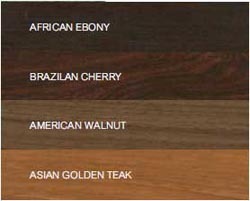 These Cabinets are made to order and take 4 to 6 weeks to ship. Opens up to 123" across with the side arms extended. If you'd like additional cutting or crafting space, the CraftPro Plus IV is the perfect companion table for your suite. Enjoy 28 square feet of space for measuring, cutting, piecing, crafting and more. Plus, take advantage of two convenient notions palettes, adjustable shelving and two stationary machine platforms. Quilt Pro Plus IV The QuiltPro Plus IV brings style, symmetry, and space to your sewing room. In addition to 23 square feet of workspace surrounding your machine, you'll find storage to the left and right, ensuring that the notions, thread and fabric you need are always on hand. 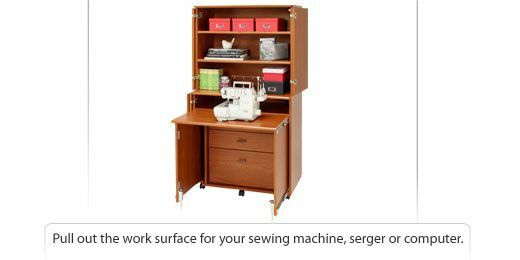 When paired with a CubPlus IV, a serger or additional machine is always within your reach. You'll also find room for 2 Madeira Thread Treasure Chests, giving you a stunning home for more thread than any other Koala Studio. 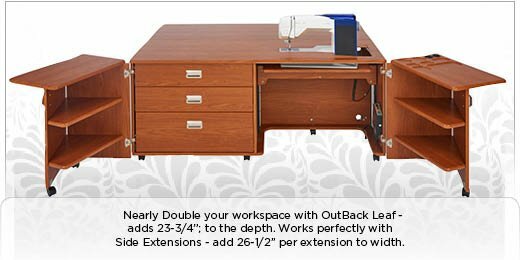 Outback leaf: to D, add 23.75"
The Cub Plus IV is perfect addition to a small sewing area or spacious suite. Know that whatever size your room is, you won't have to sacrifice on style! With two versions available, the Cub Plus IV is uniquely adaptable to your room. The left Cub Plus IV includes a smooth fabric palette, while the Right Cub Plus IV includes a notions palette that holds your notions with convenience and style. Outback left: to D add 23-3/4"
The Sew Mate Plus IV has everything you need to maximize your sewing area, no matter how big or small. This gorgeous studio perfectly complements your home as well as the capabilities of your machine. Enjoy spacious shelves, a home for your Madeira Thread Chest, fabric and notions palettes, an area for thread and notions boxes and more. Plus, add an Outback leaf extension for additional surface space when you need it. The Sew Mate Plus IV finds the potential in sewing rooms of every size. The trusted Roll About Plus IV is the perfect companion piece for any room that needs extra storage and space. Add three large drawers and extra workspace to your suite by placing this next to your studio. Plus, the Roll About Plus IV can also adapt to the corner of your room like no other piece with the optional corner top. The Storage Center Plus IV does exactly what it promises - adds an astonishing amount of storage to your suite. Enjoy six spacious soft-touch, self-closing drawers and space for fabric, thread and cutting mats. There's even a place for your Madeira Thread Treasure Chest. Plus, you'll have the freedom of over 22 square feet of work space with the optional Outback leaf. Create an oasis for your next project with the Treasure Chest Plus IV. 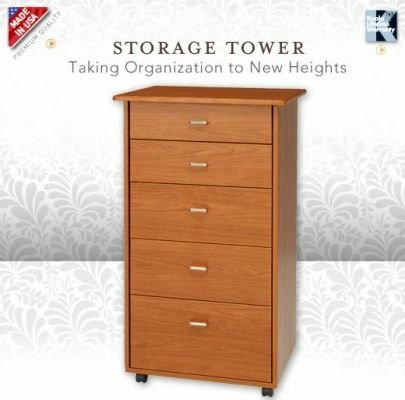 Discover the height, storage and creative space you need to be organized. Enjoy three large drawers for incredible storage, plus space for Madeira Thread Chest. Keep your supplies on hand with the convenient notions palette. 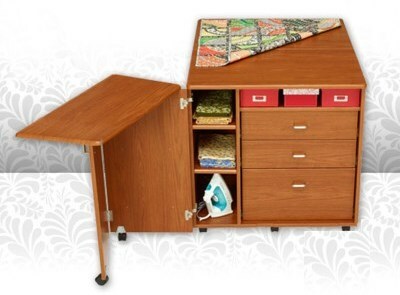 Enjoy every inch of usable space in your sewing room by pairing the Treasure Chest with a Storage Center. 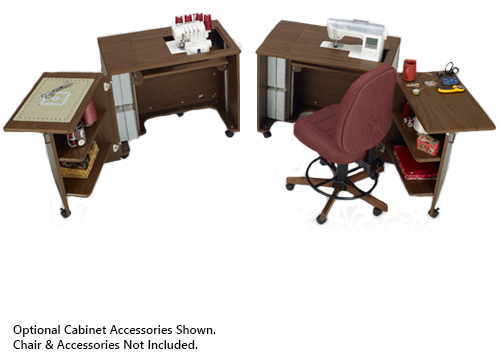 The Treasure Chest is the perfect height to work comfortably while sitting or standing. Lower your machine to enjoys a cutting table with over 22 square feet of work space when open. A perfect companion to the Treasure Chest is the Storage Center. Built in the same height and dimension, they can be used side by side or back to back. If you enjoy a variety of techniques, multi-tasking with projects and exploring new ideas, the DualMate Plus IV has the versatility you've been searching for. You'll find a home for you sewing, embroidery or quilting machine, and a serger - all in one studio! Lower the machines you aren't using for a larger surface area or instantly take a project from one machine to the other! A compact 35-1/2" x 22-1/2" when closed, the Small StorageCenter is big on storage and organization. Add the optional outback leaf extension to create a generous 35-1/2" x 45-1/2" cutting area- the Small Storage Center comes standard at the ideal cutting height of 35-1/4". 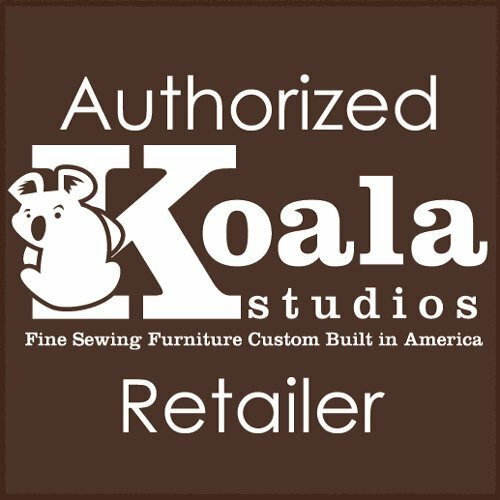 Large capacity drawers, an extra long fabric palette, and lockable rolling casters make this piece of Koala furniture an excellent companion to any studio. Extra large fabric palette 35" x 15-3/4"
The Koala Embroidery Center Pro Plus IV features a large, flexible wok area to help you achieve your biggest embroidery goals. 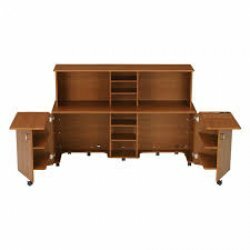 And with large, soft-closing drawers, adjustable shelves, and space for the largest frames and smallest notions, everything you need can be right at your fingertips. Created to complement any Koala studio, the design center plus IV provides a home for your second or third machine or can be used as a computer or office station. Like all Koala studios, it can be ordered as a base model and then customized to fit your studio needs. The top work area is a solid surface without a machine lift platform, providing versatility to be used for machines, computers or as a desk top. 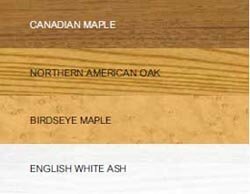 Outback leaf: to D adds 23-3/4"
The Creative Armoire is ideal for tighter sewing spaces. 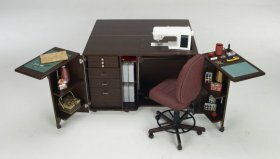 It comes with a storable work area built to hold a sewing machine, serger, or computer, giving the option of both a sewing area and design station. 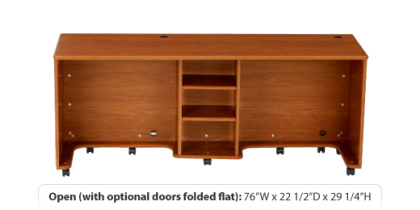 The Creative Armoire also comes with a removable fabric palette and multiple and adjustable shelves for ample storage. Plus, the entire piece is built with four lockable rolling casters making it easy to move and fit in any room. Bi-fold door with extra large fabric palette- 35" x 15-3/4"